Here is the result of developing an instant film in Caffenol. I first tried if the Filmleader would clear in fixer and threw it in Ilford Radpid Fixer 1:4. 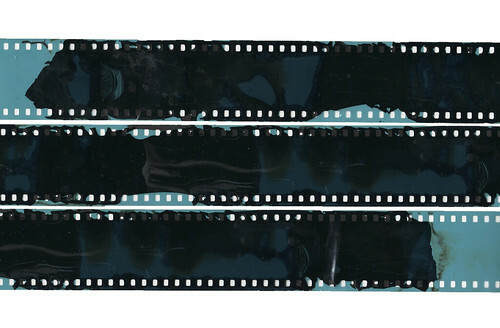 The emulsion (which is quite thick) separates from the Film base, and that’s it. Then I’ve mixed up developer and developed for 13 minutes at 20 degrees. Stop bath (water) and 5 minutes fix. I did not wash extensively, as I was afraid of washing off the emulsion which might show an image. So there is nothing. not even a tiny bit of the stuff I photographed. I have a fair bit of Polachrome, with some more in the mail. While that black gunk you can see can be cleared by slipping the film through your fingers when it is wet/after soaking in water or fixer, the developing process it self relies on a developing “pod” which, when put together in the right order in the propriety processor, creates instant slides. From what I understand, the chemicals in the pod activate the dye couplers (or whatever causes the image to form!) in the same way that a normal polaroid would – it just happens in a controlled environment. 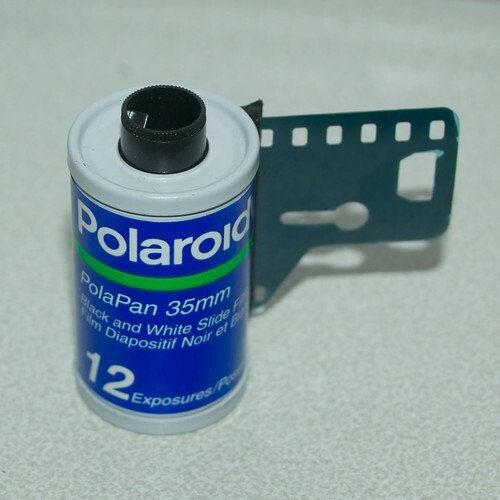 I’m actually preparing a review of Polachrome for our website http://www.feelingnegative.com so I’ve bookmarked this post so I can provide an example of what happens when the film is not used in conjunction with the appropriate chemicals.